My imagery reflects both the Rocky Mountain forests of my childhood and the Pacific Northwest of my adulthood. I paint with Encaustic, which allows me to slow down and reflect. Images evolve in layers because the medium is organic and hard to predict. 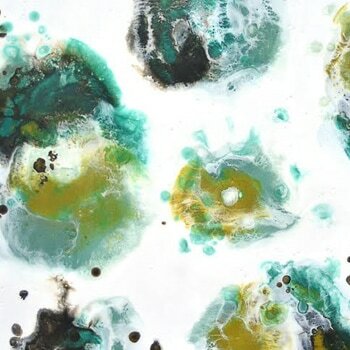 My materials come from nature—beeswax, pigment, oil, and tree resin. Tools are purposeful: the razor blade, the spatula, and hogs hair bristle brushes. Fire is the element that merges them. The paintings are about human emotions -- fears, anxieties & self-doubt. The imagery is rooted in abstracted nature; about what lies beneath and what floats above, with an emphasis on where the two meet. DIRECTIONS: 5 miles north of Coupeville, turn onto Hastie Lake Road. Follow that through several 90 degree turns and a straightaway. Turn left at 1739 Hastie Lake Road.